Plus, how theft could become a problem for charging stations in the U.S.
Harding Park Golf Course, San Francisco--Is the electric car charging station of the future a Winnebago? It could be in some circumstances, speculated Luis Ramirez, CEO of the Industrial Solutions Group at General Electric. Ramirez recently met with some consumers and customer groups in Oregon, and some asked whether it would be possible to use the engine of an RV to charge an EV. RV drivers often tow cars behind them as they travel on down the road. 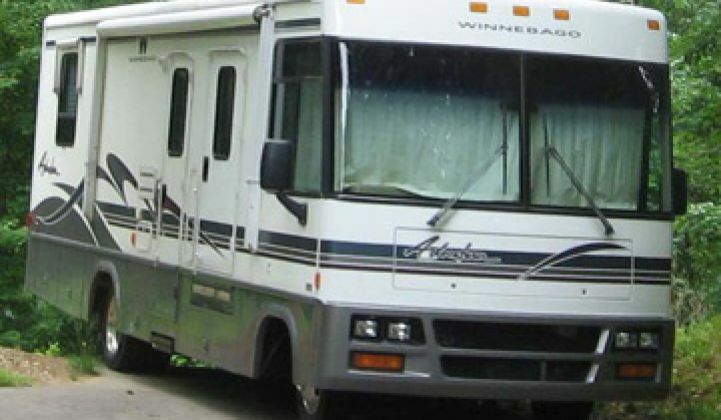 Coming up with a charging system for RVs would help open a niche market. Technically, it's not impossible. Ramirez and other GE executives are in the middle of a road trip to promote products such as the WattStation charging station and to create awareness about some of the issues that will face companies when EVs begin to hit the road in large numbers. It wasn't your usual Silicon Valley audience. Instead of investors and job seekers, most of the attendees were executives from parking lot companies, some AAA representatives and many electricians -- in other words, the people that are actually going to make this happen. We sat down with Ramirez and others, and here are some of the issues on their mind. --Theft and security could become a problem for public charging stations. "There is a lot of copper in a charging station. We do have to worry about security," said Ramirez. In Europe, security is less of a problem because charging stations will have cables: drivers will be required to carry their own connections. The U.S. took a different approach. It lightens the load in a car, but it creates a potentially attractive target for those out there intent on stealing wire, manhole covers and other metal objects during this current commodity boom. Speaking of commodity metals, scientists in GE labs are also working on electric motors that don't require rare earth metals and use nonmetallic heat sinks. This is a significant development because rare earth materials like neodymium oxide have zoomed from $20,000 a ton in 2009 to $165,000 a ton this month according to my own spot check today. --Direct current is going to take off, Ramirez added. While the grid delivers AC power, distributing and using DC power within microgrids, datacenters or office buildings could help conserve energy by reducing the number of conversions power must undergo before it gets used. The conversions occur because most electrical equipment -- batteries, motors, computers -- actually run on DC. In a typical data center, power might get converted five times before it can be used to run servers; in a DC data center, the conversions can be reduced to one. Fewer conversions, fewer losses. Back in December, Ramirez oversaw the $520 million acquisition of Lineage Power Holdings , which makes equipment for efficient AC-DC and DC-DC conversions. Other companies in this space include Validus DC Systems and Nextek Power Systems. "With the right conversion architecture, you can bring efficiency to the 92 to 95 percent level," he said, "DC architectures also use a lot less metal." One potential application: mining operations. Many remote mines have been completely automated with robotic trucks hauling dirt from deep inside the earth. Crushing rocks in mining operations alone accounts for 7 percent of the world's energy consumption, he said. Switching to DC could help bring that number down. --One area, however, where DC will need some work is in high-speed charging stations. High-speed, or Level 3, charging is far faster than conventional charging and it relies on DC power. High speed charging, however, can accelerate the aging process in batteries. Research in this area is ongoing. --Consumers will likely have to drive the EV market, said Clarence Nunn, CEO of GE Fleet. (GE Fleet oversees its own fleet of 30,000 cars but also finances and manages fleets for others.) While fleet owners are interested in going electric, the price will have to come down through volume manufacturing before many fleet owners budge. And the only way to build volume will be with the consumer market. --Car companies are going to have to pay particular attention to the needs of the fleet buyers. Plug-in hybrids, particularly those retrofitted hybrids with lots of batteries in the trunk, are a difficult sell to companies with sales fleets. The trunk takes up the space the reps need for sample cases and other equipment. GE, which wants to electrify half of its fleet by 2015, has to plan accordingly, as well. The average GE sales representative drives 85 miles a day. Ergo, a fully electric vehicle may not work for them, although a series hybrid like the Chevy Volt might be sufficient. Similarly, many in GE Health drive vans: not a great combo yet for batteries. So far, pharmaceutical companies appear to be the first movers when it comes to electrifying fleets. --Battery swapping, the secondary market for batteries and other issues are hurdles the car industry and financing industry are going to have to overcome. "I do not want to finance a battery. That does not work for me," Nunn said, or at least it doesn't yet. If car companies can begin to prove that a battery will have an active life in a car for five years and that utilities will in fact buy partially depleted batteries for grid storage, bring on the documents. --The demographics of EV buyers do present some problems for utilities, said Matt Lecar, who oversees smart grid strategy at GE Energy. In California, a lot of the early buyers will live in Berkeley and San Francisco, where the grid is old and the power capacity for individual houses is somewhat low. "I am sure if PG&E had their druthers, Fresno and Bakersfield would be the early adopters," he said, because homes there already have mondo circuits to handle air conditioning capacity.